Time Series DBMS are a very specialized type of database management system, optimized for storing and processing series of values associated with a timestamp, for example sensor measurements or any kind of business or process indicators. 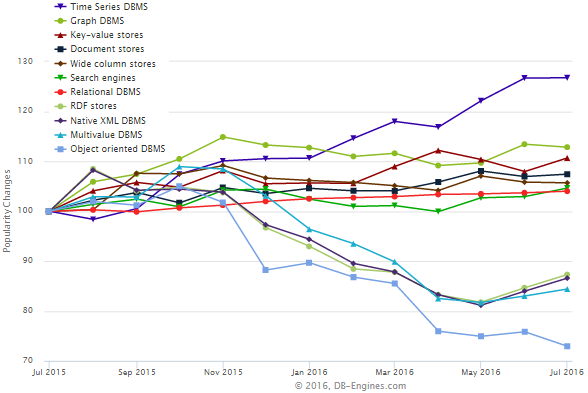 In the DB-Engines Ranking we measure the popularity of 300+ database management systems. When we cluster the popularity scores by database category, we see that Time Series DBMS gained 26.7% popularity in the last 12 months. This is more than twice as much as Graph DBMS, the second best category in that time frame. Obviously, any general purpose DBMS can handle time series. However, the specialized features often needed for time series, or performance tuned for typical use cases, makes Time Series DBMS an attractive choice in an increasing number of cases. This results in a fast evolving variety of systems available in that category. One of the most basic tool in our list of Time Series DBMS is RRDtool, where time series data are stored - and removed - in a fixed round-robin manner. While this simplicity may be just what you want in some applications, RRDtool has lost in popularity to more sophisticated systems recently. The most popular time series DBMS now is InfluxDB. That's not bad for a system that is only three years old, and has not yet reached version 1.0. Powerful features such as flexible retention policies for time series values or continuous queries for downsampling the data, make InfluxDB an attractive choice. The fact that the single server version is open sourced certainly also helps to increase popularity. The next system in the ranking is Graphite, which is not only an open source DBMS, but also comes with built-in graphing and monitoring capabilities. Another top ranked open source system, OpenTSDB is based on HBase. On the one hand, this design adds a layer of complexity, while on the other hand, you get a stable distributed system, which may be harder to achieve using other systems. If raw performance is a top requirement in your application, then KDB+ might be a suitable system to process your time series. KDB+ works best as in-memory store, but it also supports file-based operations, if you can compromise on performance. These are only some of the most popular systems in our ranking. Make sure to also check out the rest if you want to get a full overview of the fast evolving Time Series DBMS market.